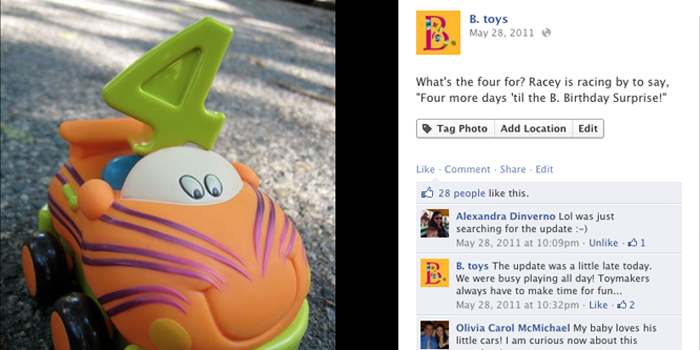 Very rarely does a team get to build a brand from scratch, but that is just what we did with B. toys. Copywriter Amy Flanagan and I worked hand-in-hand with toymaker Gisela Voss to build a toy brand which told children: Just B. You. With no advertising budget, the website and packaging had to do everything. Along with the broader team I was in charge of concept, creative direction and design of the B. website. The toy company's look is a big part of the brand identity so coming up with ways to stay true to that look in a web-friendly execution took many work arounds, but the finished product looked, felt and even practically smelled like the brand we had developed. See the site here. Of course, the toy pages had to be fun with toys you could play with on site. In keeping with the message to kids to Just B. You, the site incorporated a quote maker where Moms could make beautiful, branded art out of the cute things their kids said. 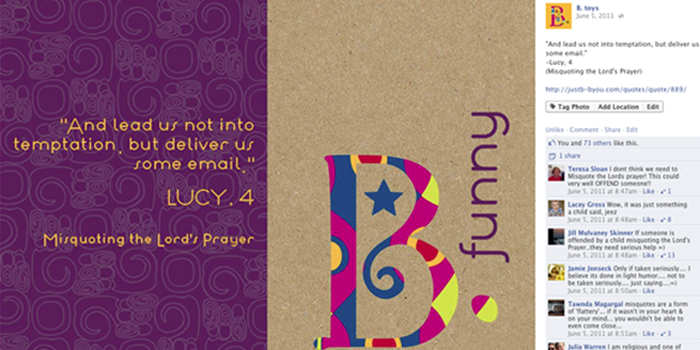 These quotes were shared by parents in social media, and by B. in little booklets in each B. package. The quotes was curated into a gallery on the site. Crowd-sourced quote booklets showed up in every package. Before creating the website, we created the trade dress which included a dynamic logo and packaging that was very different than anything the toy world had ever seen. Fun patterns, unusual dielines, a custom font and kraft paper were used along with a modern color palette inspired by the toys. The packaging was recyclable, reusable and some even reversed to become gift wrap. My team and I were in charge of all social media engagements, which included a midnight onesie giveaway, a crowd-sourced photo journal of a toy's trip around the world and engaged conversations daily. We were involved in every aspect of the PR right down to buying 347 kitty and doggy stamps that landed one of the B. toys on Ellen. No stone was left unbranded. A video shot in our client's home with kids from the block helped show shoppers what a toy could really do with a simple QR code. B. toys launched in Jan 2010. The following year sales were up 30% and they are still growing tremendously. Pretty good for a homespun brand with no marketing budget.